Many people desire to have a brighter, straighter, and more attractive smile. However, there are cosmetic flaws in their teeth that make them cringe when they look in the mirror, and those imperfections can’t be fixed with OTC products. If this sounds like you, Dr. Novak and his Weatherford team will be glad to help with cosmetic dentistry! Porcelain veneers might be just what you need to obtain a new, dazzling smile in just a few dental appointments. That’s right — veneers can makeover your smile, producing dramatic results in a short period of time. But that’s not the only advantage they offer. They’re also resistant to stains and have the potential to last for a decade or longer if you take good care of them. The actual treatment process of getting porcelain veneers usually only takes two visits to your dentist. However, you might need to have a few preliminary appointments to get ready for your smile makeover. During these pre-operative visits, we’ll examine your mouth and make sure your teeth are healthy enough to support veneers. We’ll also talk about all the details of your treatment to make sure you get the results you want. It all begins with discussing the exact changes you want to see in your smile. We’ll also be happy to show you some examples of veneers have benefited previous patients. 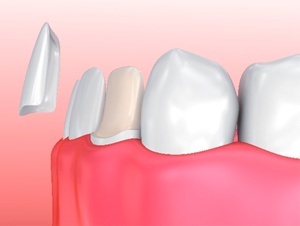 Once you commit to getting veneers, we’ll prepare your teeth to receive them. This involves removing just a tiny bit of enamel so your new smile looks as natural as possible. Then we’ll take impressions of your teeth and send that information to a lab, which will carefully fabricate your new look. After the veneers are ready, you’ll come back to our office so we can affix them to the front of your smile. We may ask you to return later for a follow-up visit or two so we can make any needed final adjustments and give you all the information you need to ensure that your veneers last for many years to come. The amount of pre-operative work you need to have done. For example, many people need to have their teeth whitened so their veneers match the color of their natural pearly whites as closely as possible. How many veneers you want to have installed. Some people go all-out and totally transform their look, while others just want to cover one or two teeth that aren’t as attractive as they would like. Veneers are an investment in your appearance, and although the total cost of treatment may amount to thousands of dollars, many past patients have no regrets about choosing to get a new dazzle with this treatment. Insurance typically doesn’t cover veneers because they’re considered a purely cosmetic procedure. However, we may be willing to work with you to set up a plan to help you afford the smile you’ve always dreamed of. Ready to transform your smile? All you need to do is contact us today.